Writing on the former Deputy Head of the Muslim Council of Britain Daud Abdullah’s website, Asa Winstanley argues there was an alliance between Nazis and Zionists. Bearing in mind all of the antisemitism Zionist Jews are receiving at the moment it’s worth tackling the arguments raised by Winstanley in his article and putting the issues he raises to bed. The Haavara agreement saved 60,000 German Jews from the grip of the Nazis. The worldwide boycott of Germany called for by Jewish organisations was feared by the Jews of Germany who were concerned the Nazis would take their revenge on the Jews they had close to hand. The Haavara Agreement was controversial when first adopted but was later enlisted wholeheartedly by the Zionist Congress of 1935 as a way of allowing German Jews to escape Germany. A month after the Haavara agreement was ratified the Nazis introduced the Nuremberg Laws effectively removing German Jews from the German populace and paving the way for their extermination. Thanks to the Haavara agreement at least some Jews managed to escape into Palestine. It is worth comparing the fury of pro-Israel lobbyists and supporters over Ken Livingstone with their silence or active defence of Israel’s modern day alliance with fascists and neo-Nazis. Israel has no alliance with Fascists and neo-Nazis. Furthermore one isn’t sure what “alliance” he’s speaking about because he doesn’t say. First Livingstone’s right to talk about whatever he wants has never been in question. What Winstanley means is Livingstone should have the right to make antisemitic statements without any consequences. Fortunately the Labour Party felt differently. Unfortunately they suspended him for a couple of years rather than expelling him from the Party. Second; no Zionism has never had a “strategy” of making an “alliance” with antisemites. In fact ‘Zionism’ didn’t exist in this format in the first place. There is no sentence you can use that has Zionism doing anything. Zionism is an ideology shared first by a few hundred, then a few hundred thousand then a few million people. There was no one monolithic Zionist group that had a strategy or made alliances that spoke for every Zionist in the world and Zionism itself never did anything other than offer an ideology of national liberation to the Jewish people. “It started with anti-Semitic Protestant Christian Zionists and later expanded to the Nazis.” Is to smear the entirety of the national liberation movement of the Jewish people. Yes the leader of Israel’s Labour Party congratulated Trump on his election. We all know, and His Excellency, the Prime Minister, also knows that there is a sizable Jewish minority living in Hungary. I made it very clear to the Prime Minister that their security, being Hungarian citizens that they are, will be fully guaranteed by the Hungarian state. I’ve also made it very clear to the Prime Minister that the Hungarian government has a zero tolerance policy against all forms of anti-Semitism. I have also shared with the Prime Minister that there is a renaissance of Jewish life here in Hungary today. And this is something that we are proud of. We believe, we think that the renaissance of Jewish life is a substantial contribution to the common achievements of the Hungarian nation quite clearly. We also mentioned, touched upon history. Well, when you have a meeting of this sort, this is not something that is inevitable, but it’s also perhaps desirable that we discuss history. So I told the Prime Minister that we are aware of the fact that we have quite a difficult chapter of history behind us. And I wanted to make it very clear to him that the Government of Hungary, in a previous period, committed a mistake, even committed a sin, when it did not protect the Jewish citizens of Hungary. I want to make it clear that it is our belief that every single Hungarian government has the obligation to protect and defend all of its citizens, regardless of their birth and origins.During World War II, this was something, a requirement that Hungary did not live up to, both morally or in other ways. And this is a sin, because we decided back then, instead of protecting the Jewish community, to collaborate with the Nazis. I made it very clear to the Prime Minister that this is something that can never, ever happen again, that the Hungarian government will in the future protect all its citizens. 1. Despite Israel’s claim to be a bulwark against anti-Semites, the historical and current reality is that the Zionist regime has never cared about anti-Semitism globally. 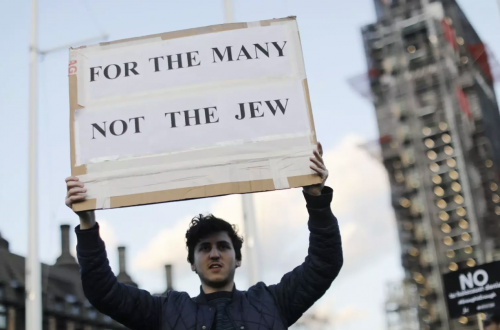 Israel is a majority Jewish country it doesn’t “claim to be a bulwark against antisemites” it is a country where there is little to no antisemitism by virtue of the nature of the populace. Furthermore if there hadn’t been any antisemitism globally Zionism would never have come into existence. Antisemitism is the force that brought Zionism and by extension Israel into being, antisemitism is what drove Jews to Palestine in the first place and Middle Eastern antisemitism is what strengthened the nascent state of Israel when, in the wake of Israel’s War of Independence, the defeated states expelled their Jews. Or more accurately, it actually encourages and benefits from anti-Semitism. When there were anti-Jewish attacks in France, Netanyahu visited the country, claimed to be the Prime Minister of all Jews and called for French Jews to “come home” to Israel. Winstanley turns logic on its head. Because Israel has turned mass migration to its shores into an advantage (not without a great deal of hardship) therefore antisemitism must be caused by Israel. It will be interesting to note whether Winstanley blames Germany for ISIS on the basis of the fact that it has admitted one million refugees. Jews from countries around the world have been lucky to have a place they can go to escape antisemitism. The Yazidis and the Kurds are in no doubt as to the necessity of such a homeland. It’s to Israel’s credit that it remains prepared to accept such large numbers of desperate people despite the economic difficulties the country faces for their absorption. When there were anti-Jewish attacks in France, Netanyahu visited the country, claimed to be the Prime Minister of all Jews and called for French Jews to “come home” to Israel. The Jews in the synagogue where he was speaking responded by singing the French national anthem. Netanyahu, it seemed, apparently wanted the “Islamic State” fanatics responsible for the anti-Semitic attacks to succeed in their aims of ridding France of its Jewish citizens. Unless Winstanley is in contact with ISIS and has access to a plan the rest of us know nothing of he might wish to take note that ISIS just murdered Jews in France, they didn’t express some wish to merely remove them from the country. Perhaps he also wishes to castigate French Jews leaving for the UK or blame the UK for antisemitic attacks in France since Jews are moving there too. The Jews of Iraq, who mostly left in 1950, claim that attacks on their community were actually a plot by Israeli agents to drive them out of the country and head for Israel. Iraqi-born Israeli historian Avi Shlaim once recounted that, despite the fact that he’s yet to find evidence in the state archives for this, all of his Iraqi relatives believe that the bombings were carried out by Zionist agents, not Iraqi Arabs. Whoever was behind the bombing campaign, Israel certainly benefited from it. Again turning cause and effect upside down Winstanley argues that Zionism is antisemitic rather than that it is the product of antisemitism. This argument is the equivalent of arguing that Martin Luther King was a racist who exacerbated racial tensions in the United States in order to make his own movement more popular. Note that in Winstanley’s quote of Roth’s piece she writes “Nazi — allied organisations” and in Winstanley’s piece he has jumped to “Nazi groups”. Facts matter, accuracy matters. As with the Freedom Party of Austria, Israel officially refrains from direct contact with the FN due to its history, but nonetheless allows its members into the country. The Israelis are more interested in actions than words. They remember when “hundreds of Jews were trapped inside a synagogue” until “police units were sent to rescue them” in 2014 by these so-called peace activists. 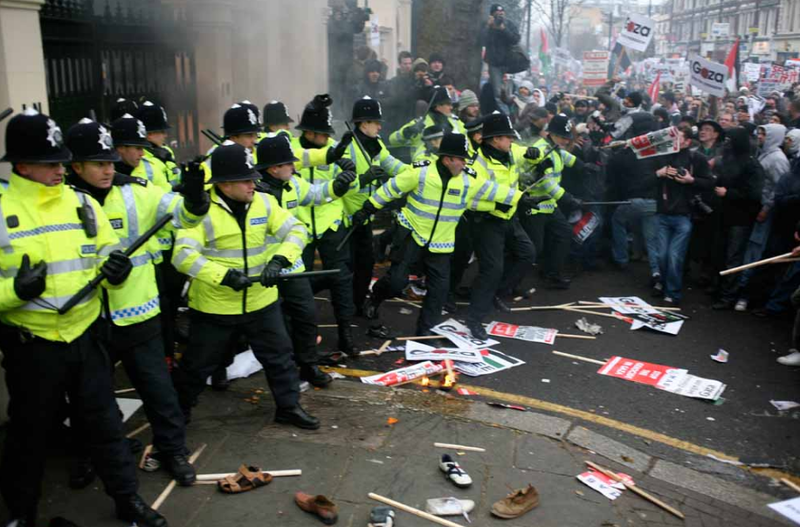 They remember riots in London outside the Israeli embassy in 2008 when a sea of Free Palestine banners were waved by the same people who were throwing barricades at police. Winstanley himself is a member of the Boycott Divesment and Sanctions movement yet instead of attacking Israeli government policy (as one might expect from a Pro Palestine activist) he spends all his time writing articles that play to the grossest antisemitic stereotypes. As said earlier in this article facts matter. It matters that Winstanley distorts the truth, it matters that he attacks Zionism and that he attempts to dictate the meaning of the terms ‘antisemitism’ and ‘Zionism’. It matters that he offers sources that don’t support the arguments he’s making when he’s fact checked. It is poison like his, that doesn’t stand up to scrutiny which is causing Jews in the UK so many problems today. At last count his article had been shared on Facebook just under 700 times. The people who read that article will be less educated about Zionism than they were if they had read nothing at all. They will feel angry and frustrated about a global situation that exists only in his imagination. We need to fight this false messaging, to use facts to counter the fiction written about Israel as a part of the Bully Demonise and Slander campaign being perpetuated against Israel or else the only truth that will matter is the one Winstanley makes up.